Curiosity rover selfie on Mars. Marc Kaufman has written about science and international affairs for more than three decades, primarily for The Washington Postand The Philadelphia Inquirer.Kaufman's latest book is "Mars Up Close: Inside the Curiosity Mission" (National Geographic, 2014).Kaufman contributed this essay to Space.com's Expert Voices: Op-Ed & Insights. To the worldwide legion of enthusiasts following the trek of the Curiosity rover across Mars, the announcement last week that Gale Crater had featured lakes and rivers for potentially tens of millions of years was another important moment in the evolving story of Mars as a once-habitable planet. It's a story line that Curiosity has aggressively developed and now owns, and it is arguably the biggest story in space exploration today. The ultimate goal remains the detection of remnants of ancient Martian life if it once existed, or even perhaps finding organisms alive well below the surface. But ground-truthing the theory that parts of Mars had the necessary ingredients to support life is a seemingly indisputable triumph. Understandable because an outside senior review panel commissioned by NASA harshly criticized Curiosity over the summer, and unfortunate because the harsh words from the panel seemed to be misguided and reflected a puzzling lack of knowledge about the mission. Curiosity has not drilled enough to make proper use of its two sophisticated miniature chemical labs, and there are no plans to do so. The drilling and chemical analysis proposed for the next two years represented "a poor science return for such a large investment in a flagship mission." The proposed next phase for Curiosity "lacked specific scientific questions to be answered, testable hypotheses, and proposed measurements and assessment of uncertainties and limitations." "In summary," the panel concluded, the Curiosity proposal for continued funding "lacked scientific focus and detail." Of the seven ongoing NASA missions studied by the panel, Curiosity got the worse ratings and the sharpest criticism. By far. Having spent two years in and out of the Jet Propulsion Laboratory talking with Curiosity scientists and engineers, and being present for countless discussions and planning meetings, I found the assessment baffling. In full disclosure, I've written a book about the first 18 months of Curiosity's stay on Mars, and that book reflects my sense that Curiosity has been among the most complex, yet fruitful, NASA missions ever. I'm sure that some things could have be done better and some plans for future exploration could be more refined, but it seems to me that Curiosity has produced major, paradigm-shifting discoveries and insights about current and ancient Mars. It has sent back by far the most compelling images of the planet ever, and the rover hasn't even reached its main destination yet. And why hasn't that happened? Because the Curiosity leadership and scientists were willing to embrace the freedom to change the course that NASA gave them when Curiosity was officially deemed a "mission of discovery." Most tellingly, the team identified a triple junction of rock formations not far from the landing site that was located in the opposite direction from the rover as the original target, Mount Sharp. Mission leaders could easily have ignored the intriguing clues, especially since instruments orbiting Mars had not detected any interesting clays that had been formed in water or other minerals at the site. But Curiosity's handlers went anyway, and during almost nine months in and around what became known as Yellowknife Bay, NASA found remains of a lake (a first on Mars), discovered a water signature in mudstone that told of a time when the liquid there was drinkable (a first), developed a method to date rock surfaces on Mars (a first) and concluded that the environs had once been habitable (a first). They ground-truthed the hypothesis that a stream or river had once flowed into the area, and made abundantly clear that information collected by orbiting satellites had some significant limitations. The Yellowknife detour ended up taking up more than nine months (roughly the time needed to fly from Earth to Mars) and resulted in countless articles in journals, including six in one issue of the journal Science. Why rehash both the criticisms of Curiosity and the track record now? NASA officials, after all, had come to the defense of the mission, while pointing out that the panel still recommended continued funding. But in light of last's weeks description of a much longer water history in Gale Crater and other breaking Curiosity findings reported at the recent 2014 American Geophysical Union fall meeting, it seems like time for others to weigh in, as well. Curiosity has been an enormously productive mission (probably the most fruitful ever to Mars), and it clearly has, in some ways, just begun. Maybe the senior panel of academic scientists was made uncomfortable by the risks inherent in some of the decisions the Curiosity team has made and will continue to make. Maybe a "mission of discovery" seems too free form to these scientists. I'd like to return now to the recent teleconference in which Grotzinger and others described how and why they concluded the lake at Gale Crater was once much larger than first imagined and that the area remained wet for many millions of years. Grotzinger's defensiveness came out especially when he described the geological features and soils that Curiosity catalogued between Yellowknife and Mount Sharp. Based on what the team saw and analyzed, it came to its conclusion about the prolonged water history of Gale Crater, a finding with substantial implications for the ongoing search for signs of possible Martian life, present or past. The team didn't do much drilling during that time (a very time-consuming process), but they did accomplish the most difficult rover traverse in space history and came up with a major finding. Hard to see that as a "poor science return," as the academies panel had declared. And then on Tuesday, NASA scientists announced several other major findings achieved since Curiosity left Yellowknife Bay. The first is the discovery of the organic gas methane, detected in intermittent spikes emanating from beneath the planet's surface. Nonbiological methods can produce methane, but on Earth much of the gas comes as a byproduct of life. This finding is, again, a first. 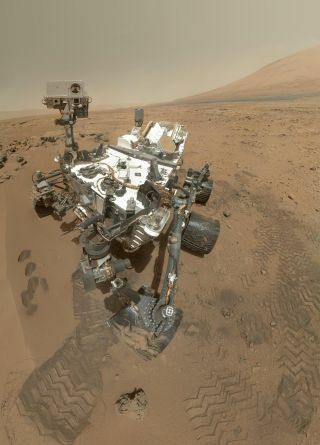 NASA also announced at the American Geophysical Union meeting that Curiosity's Sample Analysis at Mars team was convinced it had identified Martian organic compounds, which would also be an important first-confirmed detection. The conclusions strike me as inarguable: The Curiosity mission is, and will continue to be, one for the history books, providing a treasure trove of scientific data and findings. When it comes to deciphering the secrets of another planet in Earth's solar system, Curiosity has no equal.